Economic, social and cultural rights are central in the lives of women and go to the heart of addressing poverty and marginalization. 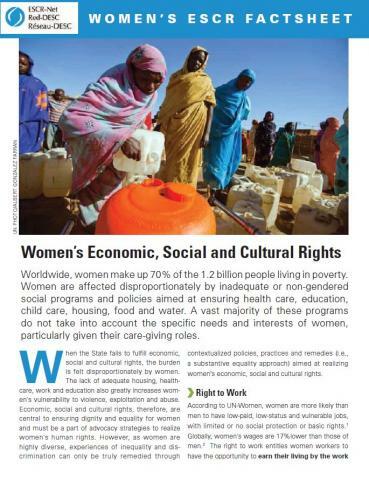 This factsheet provides a basic overview of the content of economic, social and cultural rights for women. It is intended for a wide audience and to be used for awareness-raising purposes. Please disseminate widely. Please also access this Factsheet in Spanish, French and Arabic. For more information, please contact wescr@escr-net.org.